Another Dresden novel. Another audio book. I have come to the conclusion that James Marsters is a good person to read your book. He puts life into the character and the reading that many readers do not. That said, I still prefer actually reading the book as it is a different experience. Dead Beat, unlike Blood Rites, was quite fun. It is by no means, the great American novel, but like many of the Dresden books, this one was fun, light, and keeps you interested. Unlike the prior book, Butcher lightened up a bunch on the terrible jokes. I am guessing he got a lot of comments about the terrible humor in Blood Rites and dialed it back. Yes, Harry is supposed to be funny, sarcastic, and bad at humor, but when it takes over the novel at times, there is an issue. Unlike the previous one, this book delivered on all notes: plot, character and over-arcing story movement. The only portion I found disappointing is that Harry’s cast of supporting characters is pretty much missing. Luckily, we are introduced to Waldo Butters. Waldo, unlike some other characters, Waldo is a lot of fun, and a great addition to Harry’s motley crew. 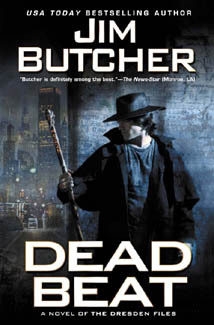 In overall Harry Dresden books, I list this one as my second favorite of the series. It does have a few issues. Notice, SPOILERS ahead. Early in the book when Harry is chatting with Bob about Kemmler and knowledge, Harry orders him to forget everything–permanently. In the grand battle at the end, Bob is stolen for his knowledge (this is ok as the bad folks do not know), but Harry is upset at this, worried that Bob will be the knowledge that the Word of Kemmler. Why? Harry had him forget everything. In the overall plot, I think this is, maybe, not an issue because Cowl does have the Word of Kemmler. But it appears to be sloppy plotting as Bob does become a major catalyst of getting Harry out of trouble, and it was a terrible way to get Bob to the scene to possess Sue. Aside from this minor quibble. I enjoyed it. Yeah, it is much better than Blood RItes. Blood RItes was just awful. If you could read only the chapters that involved the backstory for Blood Rites and move on, it would be a much better experience.